HMS Beagle was a small bark of the Royal Navy. She was launched 1820 from the Woolwich Dockyard on the River Thames. From 1831 to 1836 she undertook her famous voyage to survey the South American coast and the Pacific Ocean with Charles Darwin on board. His work would eventually make the Beagle a famous ship in history. There is a fine article in Wikipedia about HMS Beagle. This model of HMS Beagle is a small but beautiful piece of art. The ship model is 1 : 64 scale. Length is 65 cm, width 19 cm, height 51 cm. The ship can be taken out of the stand, i.e. for transport. The ship model was built without sails to allow for a better view on the rigging. 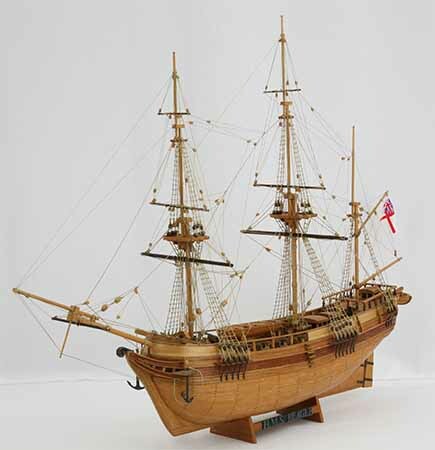 There are several views of the entire ship model taken from all directions, and several closer views of hull, deck and rigging. Click images to enlarge!